Starting any day of the week except Mondays and Saturdays, the iconic sights of Cape Town and the wondrous beauties of the Garden Route unfold before you on this 10-Day Combo Package Tour. Spend five days exploring the euro-chic city and its famed surrounds, including two free days to do as you wish. Guided small group day trips along the Cape Peninsula and Cape Winelands give you the opportunity to visit several local must-visit spots and sample award-winning wines with unique food pairings. The guided five day Garden Route tour sees you immersed in the breath-taking wilderness of the area. A visit to three national parks, including a safari drive through Addo; the chance to explore the Cango Caves, the option to bungy from the world’s highest commercial bridge jump; a visit to the Knysna heads, a chance to surf a world famous wave; and a spot of wine tasting along the world’s longest wine route are just some of the key activities you can experience on tour. Everyday except Monday and Saturday. Your adventure starts in Cape Town. If you fly in on this arrival day – we recommend booking a flight that arrives as early as possible to make the most of your time in the city.​ Your driver will be waiting at the airport to collect you and take you to your accommodation. The included airport transfer service can be booked for the first day of this 10day tour package or any date your flight arrive in Cape Town. The rest of the day is a ‘free day’, where you can choose what, when and how you would like to spend it. There is an array of optional activities that we can book for you in advance and a multitude of free experiences to indulge in – take a walk through the city’s Company Gardens or catch a taxi to Camps Bay and enjoy cocktails right on the beach. If you’re a foodie, just take a walk along Bree Street; restaurants offering delicious cuisine are a dime-a-dozen here. Please be aware that your arrival time in Cape Town will have an impact on which activities can be done. As this day is an unguided day, all transport to and from activities will be for your own account. The rugged mountain scape faces off with the crystal blue ocean of Hout Bay – your first stop of the day. This vibrant seaside community is a bustling hodgepodge of culture and is ready to welcome you to their Cape Town nook with open arms. Explore the local harbour market, or take an optional cruise to visit Duiker Island (own expense). Considered one of the world’s most scenic drives, Chapman’s Peak twists and turns along the mountainside and allows incredible views of the icy Atlantic Ocean. Take advantage of the stops along the drive, where you can save its astounding views with your camera or mind. When you arrive at the Cape of Good Hope, you arrive at the most south-westerly point of Africa. Water and wilderness collide at this national park; with handsome, imposing cliffs that are repeatedly battered by the wild waters of the Atlantic Ocean. 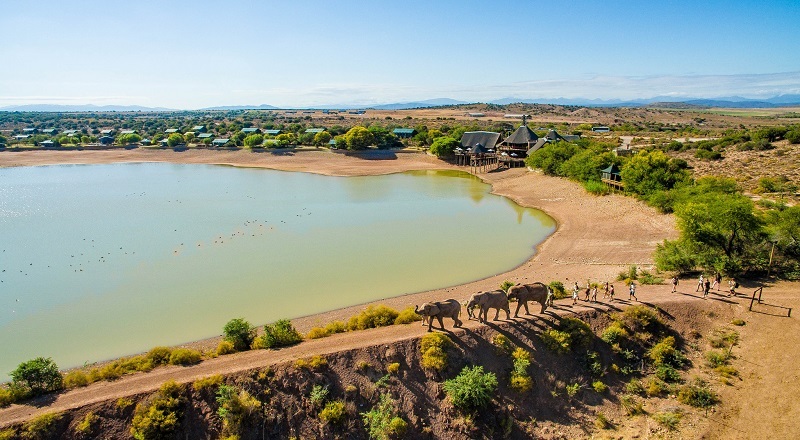 Wander along the many winding paths through the indigenous fauna while keeping an eye out for local wildlife such as ostriches, baboons, and various antelope species – including bontebok. You can also walk the stairs to the lighthouse where views synonymous with Cape Town await. From Cape Point travel to Simon’s Town’s most famous beach, and home to a large colony of African penguins, Boulders Beach. Watch as these adorable birds waddle about their business until they dive into the water and become as graceful and poised as ballerinas. Walk along the boardwalks, or enter the reserve (own expense) to sit on the beach and marvel at the simplistic beauty of seeing a wild creature in its own, natural environment. Travel through the coastal suburbs of Fish Hoek and Kalk Bay to arrive at Muizenberg Beach. The changing huts on the beach add bright pops of colour to the landscape and make for a perfect photo-op to end off the day. You’ll arrive back in Cape Town by evening. As you head out of Cape Town, the cityscape turns into the green lushness of wine farms. In a remarkably short time you’ll find yourself in the picturesque Cape Winelands and your first stop of the day – Babylonstoren Wine Farm. This garden-to-table wine farm, not only sports award-winning vineyards, but also beautiful farmlands and gardens that you can walk through. To top it off, the farm is cradled by the majestic Simonsberg mountain range. After exploring you’ll enjoy a tasting of 4 top wines made by the estate. A scenic drive through Stellenbosch takes you to Marianne Wine Estate, where a truly South African wine pairing awaits. Here your wines are paired with locally produced cured meats (called ‘biltong’ in South Africa). Sit inside the tasting room, or out on the balcony and just enjoy the new experience in stunning surrounds. For an afternoon treat, we visit Clos Malverne. 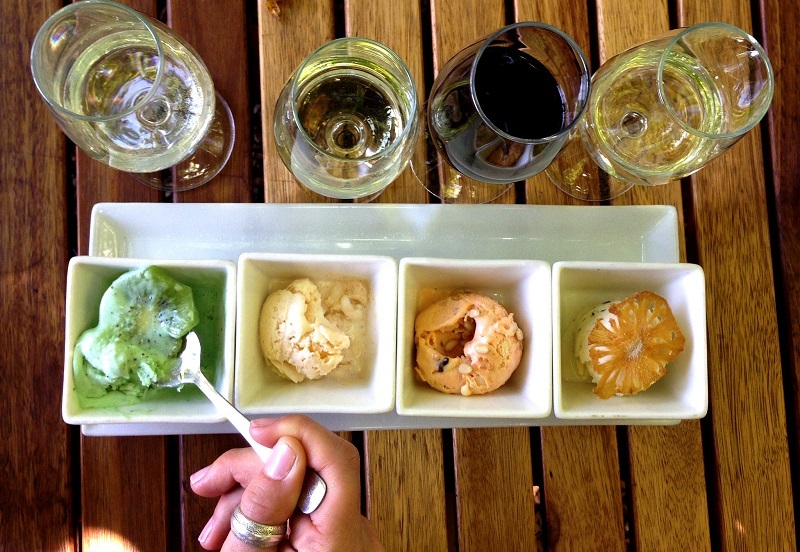 Here the wine estate’s chef creates incredible artisan ice-creams to be paired with the estate’s wines and MCC. These ice-creams are no everyday ice’s either. Expect the unusual and be delighted by the meticulous match between flavours. The last stop of the day takes you to the wine farm of internationally acclaimed golfer, Ernie Els. Ernie’s two passions, wine and golf, are married together at his farm. Explore his trophy room or simply take time to soak in the wondrous views of the valley below the estate while you sample his wines. From here you return to Cape Town, arriving back at your accommodation in the evening. Your included City Sightseeing bus ticket gives you the opportunity to travel free on three different bus lines, which explore the city of Cape Town and her surrounds. While your included return Table Mountain cable car ticket grant you priority access to one of the world’s seven natural wonders, please note that all entrance and activities that are not included in your City Sightseeing bus ticket will be for your own account. The Red bus line takes you around the city, passing through Camps Bay and to Table Mountain (the perfect place to hop-off and make use of your cable car ticket). There are 11 stops in total, and you can hop-on and off as many times as you like during the day. However, if you don’t hop-off at all, the tour is roughly 90mins long. The Blue bus line runs in a circular route that takes you to many of Cape Town’s top attractions. As the activities along this route take time to enjoy, you are limited to three stops. Choose from world-class options like the Kirstenbosch Botanical Gardens, a waterfront harbour cruise and so much more. The Purple line takes you along Cape Town’s own inner-city wine route in Constantia. There is the option to visit three top-tier wine estates; Beau Constantia, Eagles Nest, and Groot Constantia – which is also a National Heritage site. You’ll be able to hop-on and off as many times as you like, and the tour (with no hop-on and off) takes approximately 20 minutes, running in a circular route. Ever-changing landscapes, winding mountain passes and views that make you want to look twice, mark the start of your journey into South Africa’s crown jewel – the Garden Route. As you travel your guide will share an abundance of interesting facts and stories about the many hamlets and towns you pass through, making the time fly. 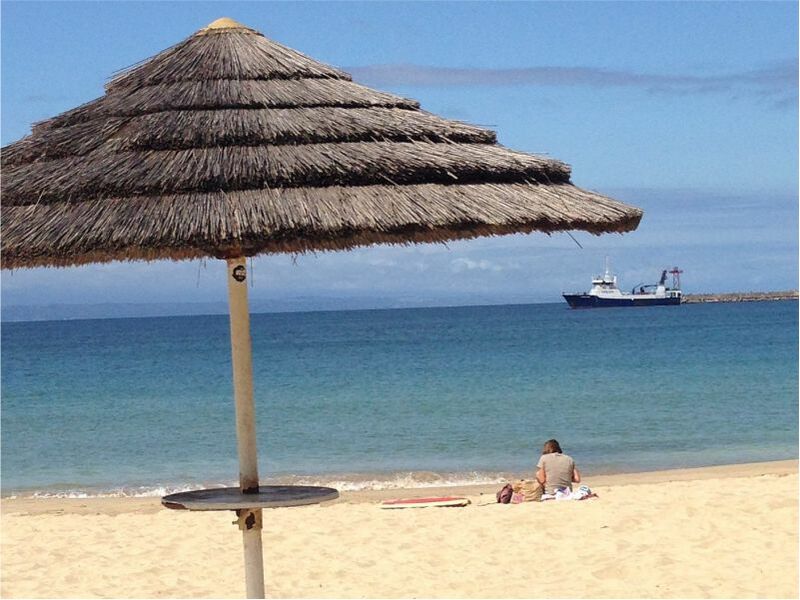 Before you know it, the ocean will be on the horizon – marking your imminent arrival in Mossel Bay. Indulge in some local seafood delicacies (own expense), walk along the beach or visit the Diaz Museum for a taste of local history. The last stop of the day sees you take to the pristine waters of Wilderness National Park in a canoe. 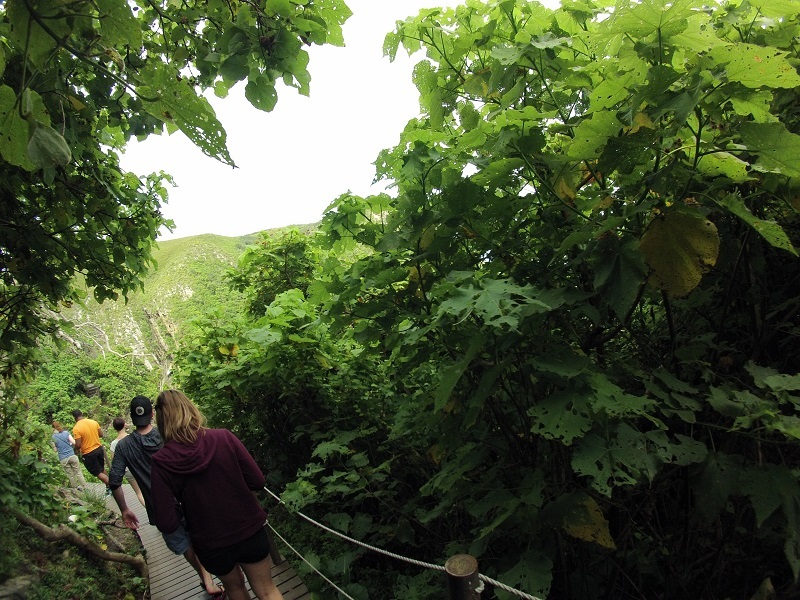 Paddle through a luscious green gorge, which can only be described as an ecological paradise. While taking a moment or two and letting the gentle current guide you, the abundant birdlife will become apparent. Keep an eye out for the region’s famous Knysna loerie, and the colourful darting kingfisher. Time suddenly seems to slow down as you arrive at Myoli Beach and the relaxed vibe of Sedgefield settles over you. Sip sundowners on the beach while watching the sun sink below the watery horizon. Stunning scenery and adrenaline-fuelled thrills are on the menu for today! 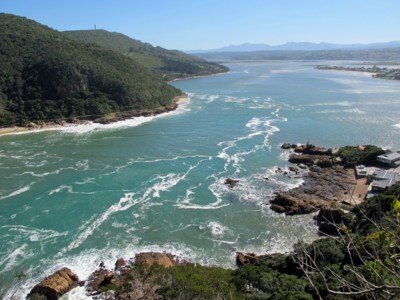 However, you start off with a leisurely stop at the Knysna Heads. These towering sandstone cliffs flank the mouth of the Knysna estuary. Soak in the exquisite views from the various lookout points. Your next stop is an hour away, and you’ll need that time to psych yourself up for the optional world’s highest commercial bridge bungy jump (own expense). 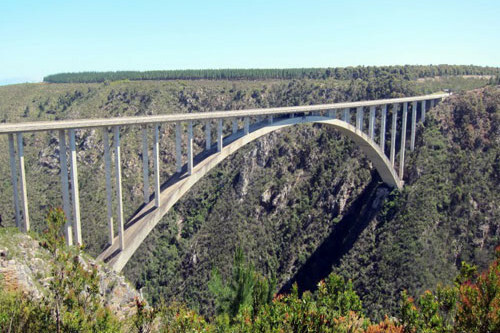 The Bloukrans Bridge is the place where the sane opt to quite literally dive into madness – 709 feet (216 meters) of madness. Crazy it may be, but it also happens to be one of the prettiest places to bounce around on a cord. Below you is the Bloukrans River; surrounding you is a deep green gorge; and behind you is the turquoise waters of the Indian Ocean. If you prefer to admire the views with your feet firmly planted on the ground, you can instead get your kicks in watching the others scream their way through the experience, while relaxing at the lookout point bar. A visit to one of nature’s impressive feats is on the cards for those who would prefer not to even look at the bungy jump. 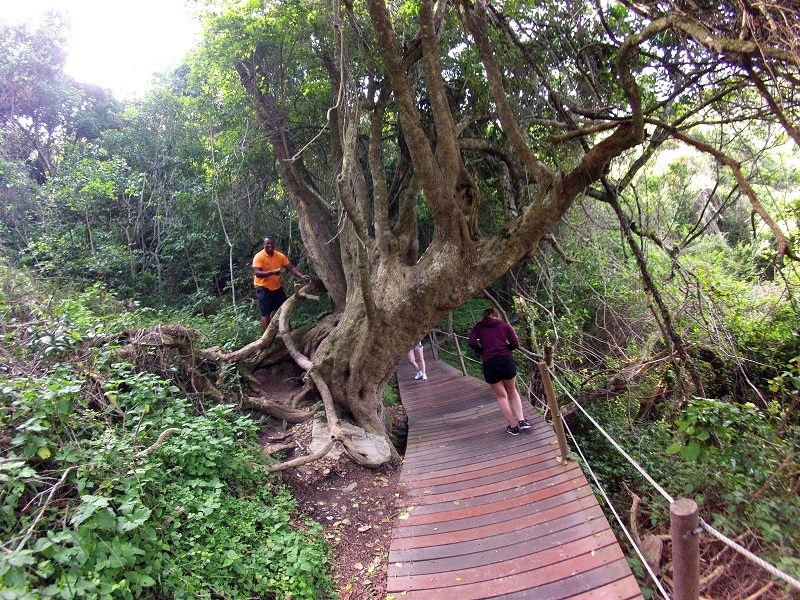 The mighty 800-year-old Knysna yellowwood tree, with its massive nine metre circumference, invokes awe and, of course, offers a prime photo opportunity. 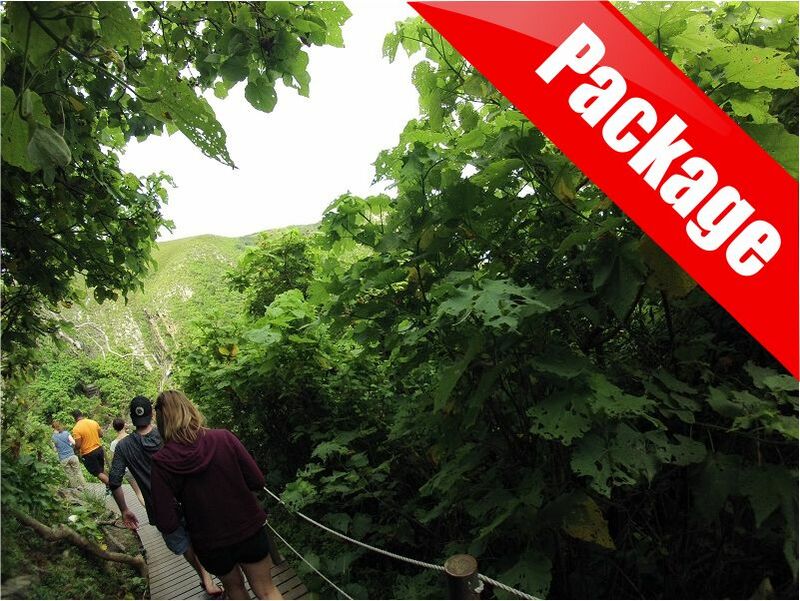 After the thrills and screams of the bungy, you’ll arrive in what can only be described as a natural wonderland. 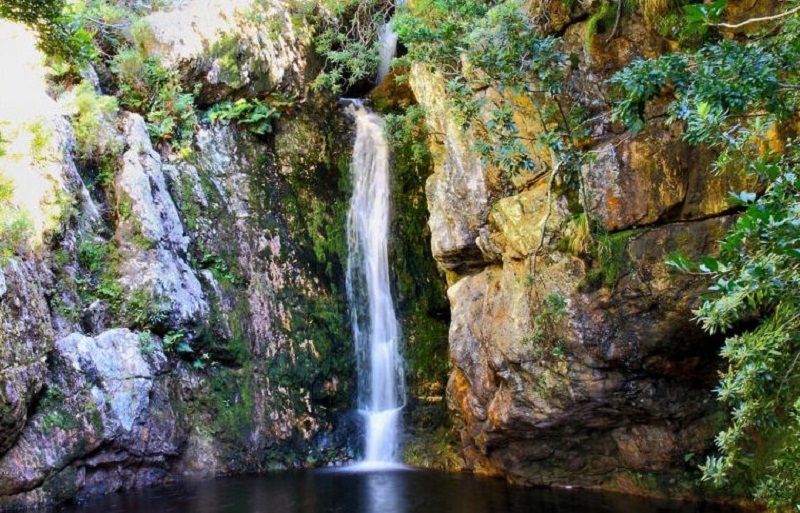 The Tsitsikamma National Park is nature showing off with lush mountain forestry that is juxtaposed with dramatic ocean views. The short, albeit steep walk to the suspension bridge is worth it, if just for the views alone; keep a weather-eye on the coastline as dolphins have be seen playing in the bay, with a whale or two occasionally joining them. You’ll likely get a thrill as fellow tourists test out the bridge’s swing factor. Take a moment or two on the little beach to just appreciate this little slice of heaven. The white shores and rolling waves of Jeffrey’s Bay (fondly called Jbay by the locals) welcome you to the country’s most famous surf town. 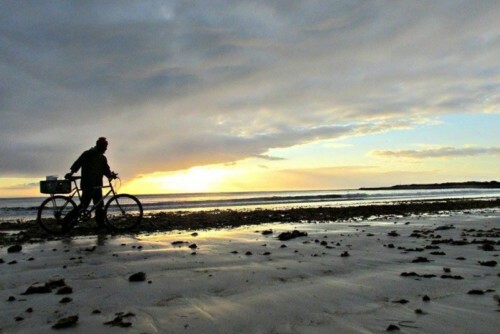 Unwind from a busy day with a walk on one the beaches and watch what promises to be another spectacular sunset. An early morning safari means a very early wake-up call, but we promise it will all be worth it. You’ll be one of the first through the gates into Addo Elephant National Park – the third largest national park in South Africa. 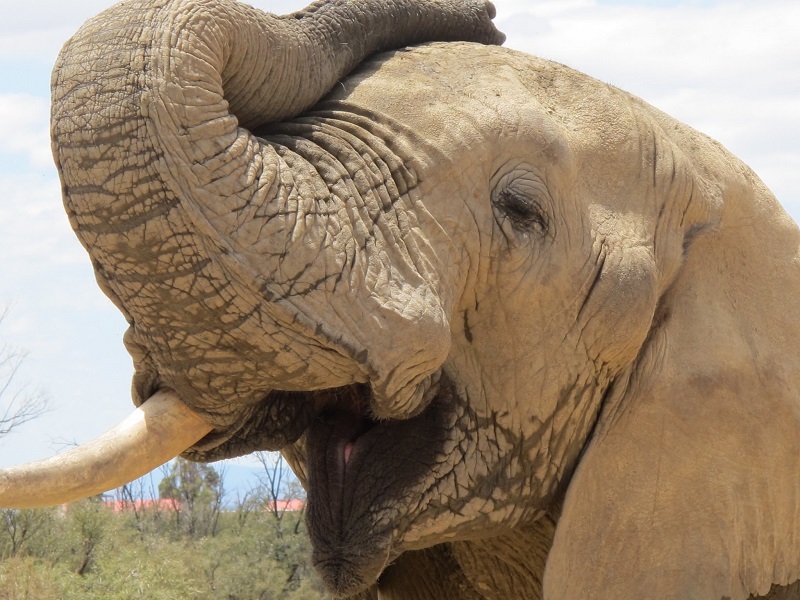 It opened with only 11 elephants, but is now a sanctuary to more than 550 of Africa’s gently giants – the largest remaining population of wild African elephants in the world. In the tour bus, your guide will drive you through 164 000 hectare in search of the Big Five – lion, leopard, buffalo, rhino, and elephant. While we almost never spot all five members, due to the size of the park and because the animals are wild and roam freely, we do try our best find them. However, you can expect to see elephants, the spotted hyena; zebras; a variety of antelope species; and warthogs. Of special mention is the flightless dung beetle – it’s found in just a few areas of South Africa. The afternoon is yours to spend how you choose in Jeffrey’s Bay. Visit one of the many surf gear shops in town, relax on the beach or surf one of the best breaks in the world. In a town that sees international surfing super-stars come to surf its breaks yearly, it is no surprise that many of the leisure activities revolve in and around the water. Try your skills on one of the beginner breaks; learn to surf at one of the many surf schools in town; or even try your hand at paddle boarding. If you’re not into getting wet, why not visit the JB Surf Museum and learn about the evolution of the surfboard, or head back out into nature by walking along the shore or optional sand boarding. Kick off the day with the exhilarating thrill of an optional waterfall ziplining experience (own expense) in the Garden Route. This experience is 40 minutes of flying across eight ziplines, three of which zigzag over the Kruis River gorge. 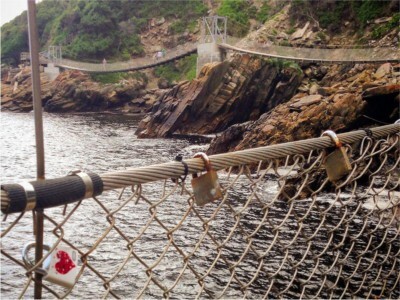 The longest zipline is 692 feet (211 meters) and the highest you’ll get is 164 feet (50 meters) above the water. As you wiz through across the lines, the dramatic scenery will change at seemingly lightning speed, so make use of the time it takes to walk the small distances from one zipline to the next to really take in your surrounds. Moving out of the Garden Route to the semi-arid desert of the Klein Karoo the incredible diversity of the country makes itself apparent. From the deep greens and blues of the sub-tropical, you now enter the hot, reddish world of Oudtshoorn – a beauty in its own right. 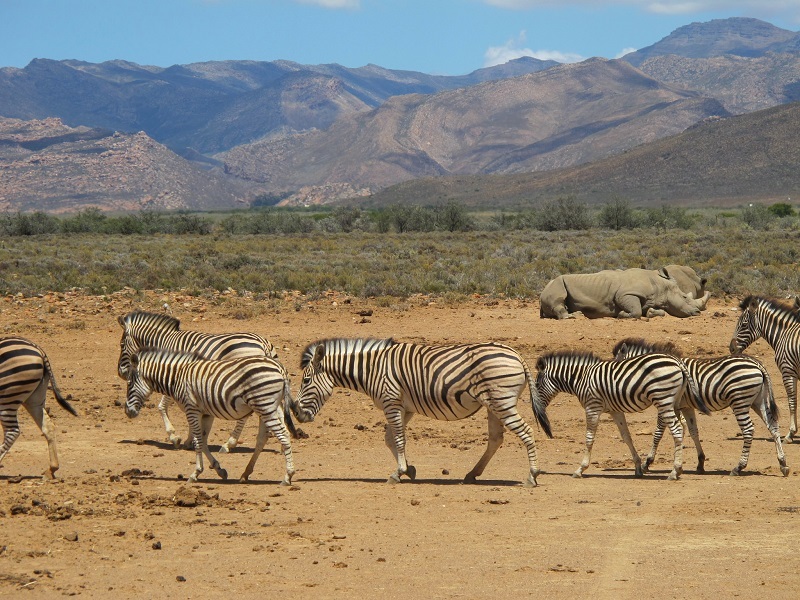 You’ll travel through the twisting roads of the Langkloof Mountain pass and arrive in the self-proclaimed Ostrich capital of the world, Oudtshoorn. The large, flightless bird is what put this small town on the map, and made it wealthy. And while ostrich feathers may no longer be worth more than gold, the big bird still supplies the town with plenty of trade. A visit to an ostrich farm allows for a peek into the world of Ostrich farming, as well as the chance to get beak-to-beak with the bird and test the toughness of the shells. 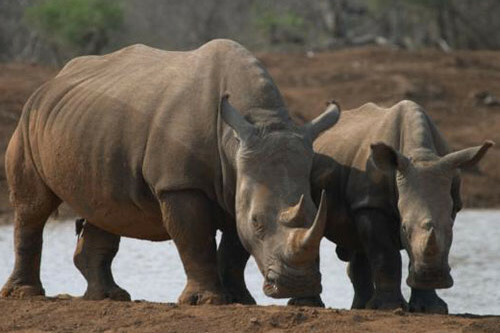 Return to the wild for an optional late afternoon 4×4 game drive experience (own expense). The natural landscape of scrub and the smaller size of this reserve make it very likely that you will spot more members of the Big Five (excluding lions). Keep your eyes peeled for giraffe (which do not live in Addo); zebra; white rhino; cape buffalo; meerkats; and zebra to name but a few. End your day with an optional ostrich braai (bbq) where you’ll have the chance to sample gamey ostrich meat, along with other South African braai staples (own expense). For those who are otherwise inclined, there are several restaurants in Oudtshoorn that cater to a variety of tastes. Ask your guide for a recommendation, and he will advise the best place in accordance with what you enjoy. Travel to the outskirts of Oudtshoorn into the Cango Caves, which are nestled in the foothills of the Swartberg Mountain Range. You never know if there are hidden beauties just below your feet and this will your chance to discover them. The incredible 20-million-year-old formations fill the underground caverns and are illuminated to show-off their extraordinary curves and crevices. There are two ways to explore the caves; the first is with the heritage tour, a more relaxed tour that involves little climbing and a more historical touch. The second way is with the adventure tour, which will see you climb, wriggle and squirm your way through the caves. If you’re not sure you can manage it, test out the spaces you will need to crawl through in the lobby’s cardboard testing station, before you decide which tour to join. From the caves you’ll begin the journey home along Route 62, which also happened to be the world’s longest wine route. And what would be the point of travelling along the world’s longest wine route if there wasn’t a stop for a little wine tasting?! 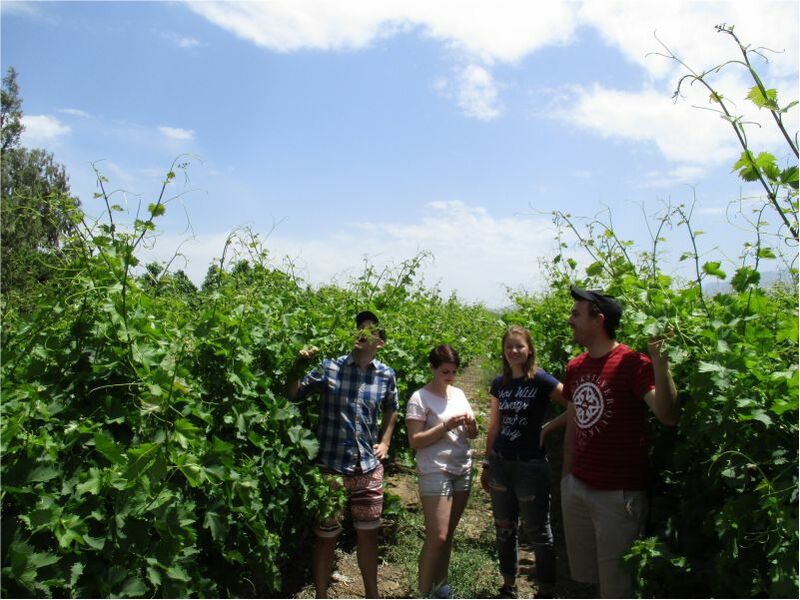 You’ll have the chance to sample some of the local wines. Take in the majestic scenery and relax as you continue your journey home to reach Cape Town by late evening. This is a free day that will happen after the Garden Route Tour. 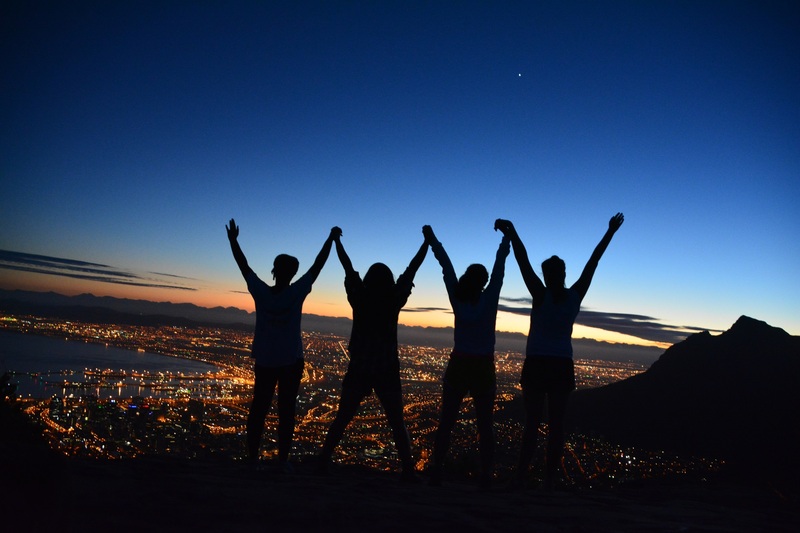 Squeeze in a few more activities before you are transported to Cape Town International Airport. Depending on your flight departure time (we always recommend taking the late afternoon or evening flight out) there are still time to explore! Relax at Clifton beach; pick up last-minute gifts at Canal Walk, souvenir hunting at Green Market Square; or take a walk along the Sea Point Promenade. 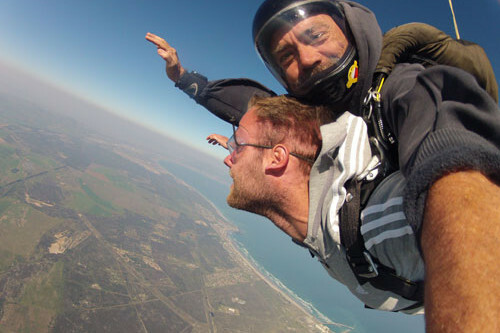 If you don’t have enough time during your free days; why not consider extending your stay in Cape Town to be able to book additional must-do activities like sky diving, paragliding, heli-flips, hiking, whale watching cruise or shark cage diving? There’s so much to see and plenty to do! Let us know what interests you most and we’ll help you book a trip-of-a-lifetime. -Some optionals are seasonal or subject to weather conditions. – Please note the Cape Town section of your tour may not necessarily run in consecutive order. Depending on your arrival and departure dates it may be broken-up into two sections, taking place before and after your Garden Route tour. Cape Point tour, Wine Tour, Garden Route Tour, City sightseeing Red Pass, Table Mountain Ticket, 9 nights accommodation, guides, included highlights and transport. Meals and drinks, souvenirs, tips, activity package and optional activities.